In 1987, a 16-year old Giovanni Del Priore left the family farm near Naples, Italy, traveling to join his brothers in St. Catherines, Ontario. Several decades later he turned those youthful beginnings into not one but three thriving businesses. “The opportunities in Canada were better than southern Italy. Coming to Canada was a great decision,” Del Priore said. He started out working in a pizzeria. By late 1990, he owned one which sold in 2001. In 1998, he and Leonardo Priore bought Criveller Candies and renamed it, Criveller Chocolate and Pastry Boutique. Its known throughout the Niagara area for awesome wedding cakes. With the bakery's success, Del Priore started a wholesale business supplying “unique food”, mostly of Italian or European origin, to restaurants and food vendors. Del Priore’s business philosophy is straight-forward, treat your customers like family and serve fresh quality food. “What I like the most is actually being in front of people, I consider myself a people person, always have. Being in front of customers is very important,” he said. In April 2018, Del Priore and Joe Manella took over an existing restaurant location at the Holiday Inn and Suites in St. Catherines, renaming it Baci Caffé. The Baci serves up an all-day breakfast sandwich with bacon or sausage, it includes a small fresh coffee. You can also choose from delicious Criveller’s canolis, pastries, donuts, muffins, bagels and chocolate truffles. They also make fresh gluten and dairy free smoothies. Their espressos and lattes are a must try. If that’s not enough, they also make great tasting sandwiches and focaccia for lunch. The new dinner menu will be revealed in a couple of weeks. Del Priore said, “Good food is simple, fresh ingredients, real ingredients, no preservatives,” that’s what you will find at Baci Caffé and Criveller’s. 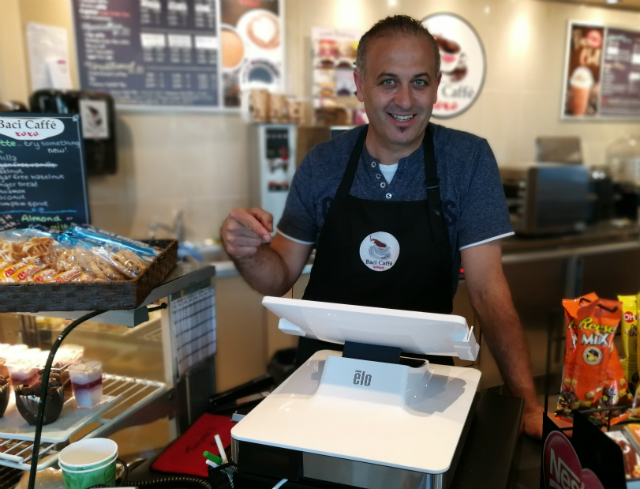 The Baci Caffé uses POS-n-go running on the Elo PayPoint all-in-one cash register. Be sure to check out Baci Caffé, 327 Ontario Street, located inside the Holiday Inn and Suites, St. Catherines. Open daily for breakfast and serving great fresh treats until 11pm.